Over the past few months, working for the first time in an office ministry setting. I have discovered that people have different working styles, and that mine is more unusual than most of them. For the first week, I was nervous about getting up and moving around the office, after all everyone else was sitting down and working steadily with only rare breaks to get up and move around. However, I noticed that I was unhappy, had difficulty focusing, and was not really working as effectively as I knew I could. So then a question formed, how do I work best? The next week, I changed how I worked. I would get up and move around almost every half hour. If I finished a project, I would get up and take a quick stretch break. I was moving around a lot, and getting a few surprised looks from others in the office, but I was also getting far more done, with far less mental hassle, than I had the previous week. I had learned how I work best. I also found that, the more projects I was given to work on and the longer the to-do list, the happier and faster I worked. In fact, I usually managed to get through even the longest of a day’s to-do lists within that day. Even when it was projected that I could do one of the projects the next day. Thus, by the end of the week I had figured out how I work best. And was operating in it. After the end of that first “active” week, I no longer get weird looks when I get up to move. Instead I get smiles, and joking comments about “walking to think” and sometimes requests for tea or coffee if I’m getting that for myself. Knowing how you work is just as important as knowing what you do best for your work. You may be operating in your “gifting” but if you are forcing yourself into a work mold that does not work for you, you will never operate to your full potential or abilities. While I know I operate best with challenges and a nice happy to-do list, I don’t always have that. But thankfully I always have something to do when my to-do list is completed, even if it is knitting. One of the reasons I love knitting actually. When approaching any ministry job, it is important to realize how you operate best, not just what you are best at doing, and finding out if your work style can mesh with wherever you will be working. Working how you work best will make any day shorter, funner, and more interesting. Not to mention that whatever you do will likely be better and higher quality if you are not uncomfortable, or tense because you are trying to force yourself into a not-you work method. At home, when you have a question or problem that you have to figure out. What do you do? When you are working on a project, do you only want to know about that one project or do you like having several projects laid out so you don’t have to worry about what to do next? Do you take breaks when you finish a project, or on a time schedule? Or can you sit in front of a computer all day and completely lose track of everything else? At home, what is your ideal set up to get the most productivity? If you don’t know the answer to some of these questions, experiment and see if you can find an answer. After you finished, you will have a fairly good idea of what works for you and what doesn’t. 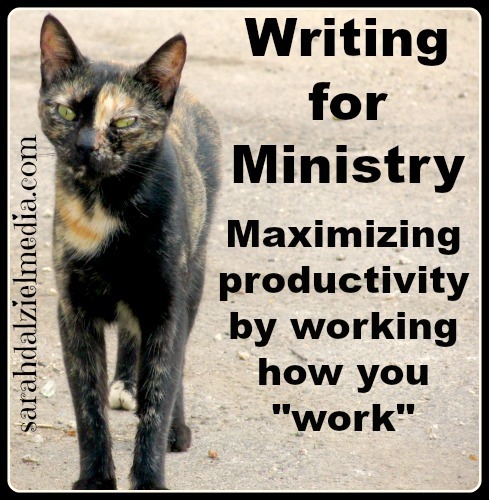 Once you know that, evaluate your ministry workplace and see if you are working optimally there, or if there are things you can do, or change, so that your ministry time is fun, productive, and interesting. What is your work method like? Is it the same or different from those you are working with? Leave a comment.